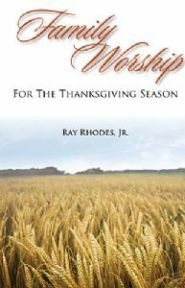 Even those Christian families who prefer out of conviction not to recognize or observe other “Christian holidays” such as Christmas or Easter (either due to their extreme commercialization or due to them not being commanded in the Word of God), commonly find they have no problem with the observance of Thanksgiving. This seems to be one holiday which believers across America can heartily get behind and agree: we ought always to give thanks! And we have much to give thanks for. The holiday itself traditionally calls us to gratefully remember how God has provided for our every need, but as the Apostle Paul taught us long before there was a Thanksgiving Day, to “give thanks for everything.” The books in this section make edifying additions to our meditations for that day and all year.